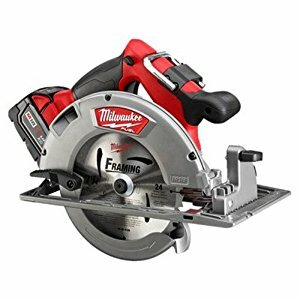 The new Milwaukee cordless circular saw (M18™) has been designed to give you powerful lightweight cutting. It is suitable for a range of applications such as electrical, plumbing, carpentry, and finishing. The Integrated REDLINK Plus™ technology makes sure that you have a great circular saw that runs safely while giving peak performance without overheating. Backed by 5-year 2,000 charge Milwaukee warranty. 1. How efficient is the Milwaukee M18 cordless saw? 2. How is the M18 handling? The soft-grip handle of the Milwaukee cordless saw has been designed to offer the user optimum balance and comfort for controlled cuts. For greater rip cuts accuracy, the M18 has an aircraft aluminum shoe guide. 3. How versatile is the Milwaukee cordless saw? The M18 Circular Saw has a useful LED light that boosts accuracy when you are working in situations of low light, and a handy rafter hook that facilitates easy in-between cuts storage. In addition, it has lower and upper guards that help in reducing tool weight without sacrificing durability. 4. How about the power and charging? The Milwaukee M18 cordless saw comes with a High Capacity RED LITHIUM ™ battery that ensures you get longer run-time, and for powerful cuts, you can get up to 20% additional torque. The optional Extended Capacity Battery Pack M18™ REDLITHIUM™ XC5.0 (not included in standard package) can deliver up to 2.5X additional runtime. The remaining run-time is conveniently displayed by the battery fuel gauge. Even better, the M18 comes with 5-year 2,000 charge warranty from manufacturer Milwaukee. You also get a1-Hour charger plus contractor bag. 5. How portable is the Milwaukee M18? At just 9 lbs. including battery pack, the M18 cordless saw is almost 40 per cent lighter when pitted against competitive corded circular saws, yet it doesn’t sacrifice performance or cut depth. With such a modest weight, compared to larger saws, the Milwaukee M18 cordless saw can run all day with less strain. Milwaukee Electric Tool Corporation is highly regarded, and their M18 cordless saw brings fast and efficient performance to any of your projects. It provides more service time per charge compared to most other competitive batteries. This is a very rugged, yet durable cordless circular saw that comes with great portability.